Neil Johnson awards Derek Black a plaque for Producer of the Year. Scott and Joleen Droubay except a Producer of the Year award from Charley Warr. 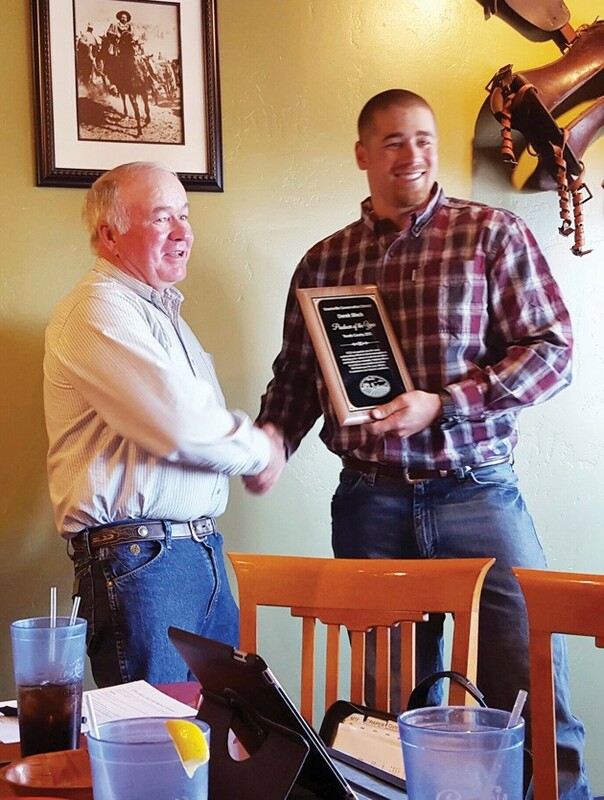 Two individuals were recognized March 30 in Grantsville as outstanding agriculture producers in Tooele County. Derek Black from Grantsville and Scott Droubay from Erda received plaques from the Grantsville Conservation District citing their accomplishments in conservation, innovation and education. The recipients and their families were invited to share dinner with the Conservation District at Casa Del Rey. 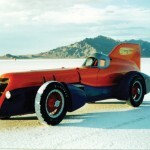 Black’s step-father, Kirt Mathews, shared stories about Derek as a youngster on the farm, described him as a “different kind of kid.” He portrayed him as a caring person who fell in love with agriculture and farming at a young age, and by the time he was in high school, knew he wanted to continue in the industry. Mathews asked, “How does someone fall in love with the farm?” He was aware when Derek was in junior high and high school that he had. Mathews explained the exhilarating feeling when a farmer finally finishes cutting a crop of alfalfa, the wonderful smell, and the sense of accomplishment of hard work — then the reality when a hydraulic hose bursts and covers him with oil. Following Mathews’ remarks, Black expressed his appreciation to his family and the conservation district for their examples — and added a person never gets things done by themselves. Black and his wife Jordan serve as Young Farmer and Rancher representatives for the Utah Farm Bureau on behalf of Tooele, Salt Lake and Davis counties, keeping the tradition of farming alive. Charley Warr introduced Scott Droubay and explained that as a young boy, he was very much involved with the Droubay family. Years ago the Droubay family moved to Delta, but Scott returned to Erda to resurrect and expand the farm in Erda. Warr expressed his appreciation for Droubay’s work ethic — how he makes every drop of irrigation water count on his crops and that the quality of the hay he grows is next to none. 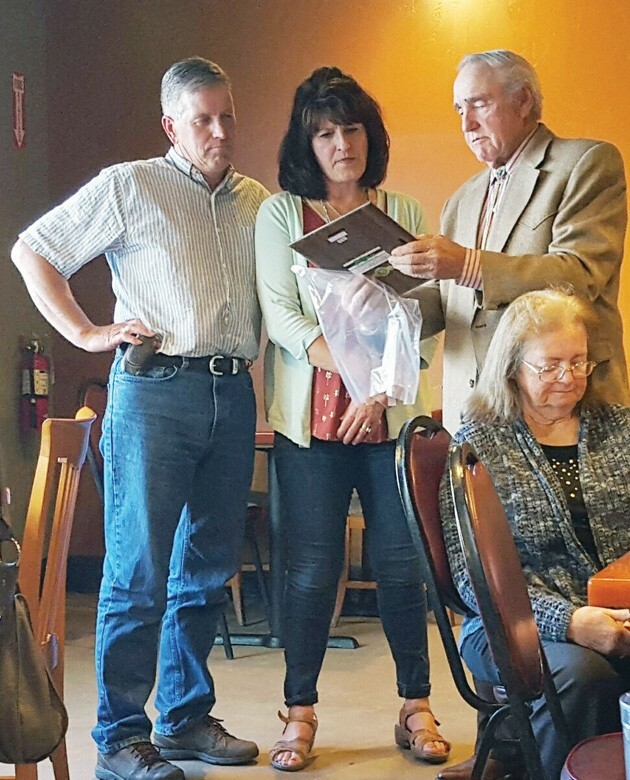 Following the presentation of a plaque for his accomplishments in agriculture, Droubay expressed his appreciation that someone noticed what he’s been doing, for his heritage in agriculture, and that he is invested in the land and people of Tooele County. Droubay feels that it’s the people that make the community a great place to live and work.